You'd never see a sight like this where the rich live, would you? When Catholics speak about “justice,” we tend to think about things such as the fair treatment of workers, peace, living wages, freedom from enslavement, etc. The images that come to mind are almost exclusively economic and peace related. For many, ecological justice is a secondary concern. Attending the RFC Philadelphia region workshop today, we were convinced otherwise. Led by Sister Maria DiBello, RSM, and attended by about 30 men and women in religious formation, the workshop was in part a viewing of a documentary by the Pachamama Alliance called “Awakening the Dreamer.” After watching the documentary and listening to her lecture, it’s impossible to see how ecological justice could ever be overlooked. One of the reasons that it deserves as much attention as the other forms us justice is that it is intimately related to the well-being of humanity and the protection of the poor. For instance, at one point, a woman on the documentary said something to the effect of, “What does it mean to throw something away? There’s no such thing as away. All we’re doing is displacing our waste to another place.” That place is almost always the home of the poor and oppressed. Pollution in the First World causes the destruction of vital resources for the already poverty-stricken Third World, dangerous water and living conditions, and leaves them highly susceptible to erratic fluctuations in climate. Lack of ecological justice, in the form of overconsumption and waste, hurts more than just the polar bears; it directly effects humanity. 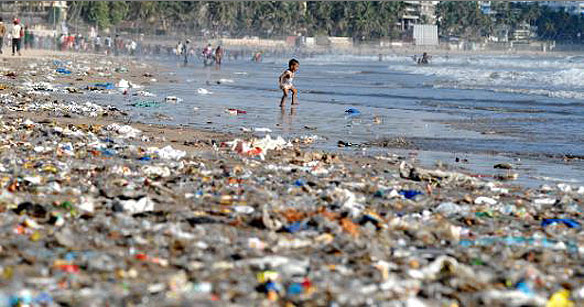 For a specific example, take a look at the effect of plastic water bottles. Though the majority of the day was a reiteration of material I studied in college, I found it all to be a great reminder of the great responsibility we have to protect all of God’s creation, and how our mistreatment of it hurts us more than we think. Often times we find ourselves in the First World becoming complacent and entirely ignorant of the world around us. The truth is, what we do effects others in the world around us. When we look at the dire state of our planet in the long run, as well as the horrific effects it is causing in the present day, we can begin to see the “justice” that is needed in the world. As Franciscans, we sometimes have to take a break from our work to be a good brother. Along with our “normal” daily schedule of prayer three times a day, mass, and meals, our weekly schedule of ministry three days a week, Franciscan class twice, Spanish class once, and two additional trips to the Poor Clares for prayers, everything has been amped up a bit: we’ve been given additional homework assignments for class, a bit of a “I can tell you haven’t been doing your chores” reminder, our ministry sites now expect us to be regular employees, and on top of that, we have the task of finding some free time to meet with a spiritual director. Phew! Talk about a run-on schedule (and sentence!). As a result, I’ve certainly cut back on a few things to make it all work, for better or for worse: my reading as slipped a bit (though I’m still reading the Bible every day), my room was a little messy this morning before I decided to clean it, my blogging has diminished, and my personal reflection has almost disappeared (that will change tomorrow). For a lot of friars, there can be a tendency to put work above all things, even brotherhood. I think the main reason that we have such busy schedules is just that: learning to be a good brother, even when busy. If work was the highest aspiration of Francis, he would have never sent out his brothers two by two because it meant half the work was being done. Certainly our work is important, but I think for our Postulant year, being busy is much more of a test and training of our priorities: even after a long day, how are we going to find time for our brothers? I’m loving the busy schedule, and the wonderful opportunity to be a brother, especially when busy. 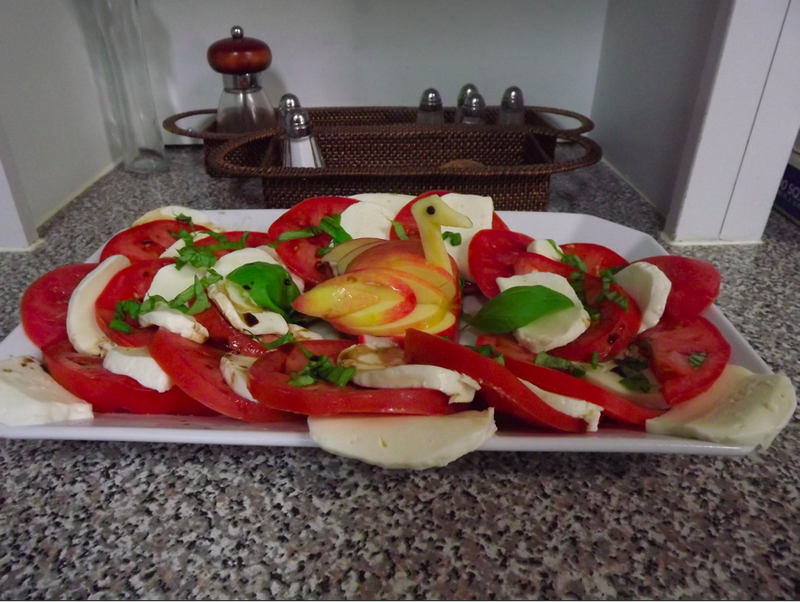 Why wouldn't you put an apple swan in the middle of a caprese salad? One of the perks of living in a large formation house is that it’s possible to hire a cook to take over a few meals a week, leaving the friars free to work, travel, or pray up until the time of dinner. Not to mention the fact that at least half of us would not be able to produce edible or satisfying meals for that many people, friars do not work 9-5 jobs: sometimes the guys will come back for dinner and be back to their ministry until late in the night. In a lot of ways a cook is a necessity for a house this large and active. That being said, we’re still responsible for our own breakfast and lunch everyday, and dinners on the weekend. Generally speaking, our director Ron will take one day and the Postulants are responsible for another, rotating among those confident enough to prepare a whole meal. Tonight, Sergio (whose parents are from Italy) made an Italian meal so good it was worth writing about on the blog. Though we don’t partition the meals into courses, the meal started with two types of salads: standard house salad, and a caprese salad pictured above, complete with an apple carved into the shape of a swan (why not, right?). The main course was a linguini with marinara sauce and Italian sausage. Though none of this was made from scratch, he did a great job of adding a few spices here and there to make it extraordinary. On the side we had sauteed carrots and broccoli rabi, with a homemade loaf of bread. For dessert, a simple sugar free strawberry Jello with a few slices of strawberries on top. Not only was every dish prepared to perfection, Sergio had a lot of fun experimenting with the garnishes and creating little works of art on the food. Though I can’t say that I did much more than lend a hand here and there (I handled the Jello all by myself), it was great to be in the kitchen most of the afternoon providing a service to the rest of the community. It can be a great place to talk while you pass the time, and it comes with a great sense of fulfillment when everything is plated and served for the others. Sometimes we’re Mary, other times we’re Martha, and I think it’s a sign of a great community when we can take on either role from time to time. Where is God in our suffering? Right here with us. After a long and busy week that allowed me almost no time to write, I finally present to you my concluding reflection on theodicy: the existence of evil as a source of suffering. As I outlined in the previous two posts, I believe that suffering can be caused by a number of sources, both good and evil, and that God can certainly play a role in the former category. But what about the latter? Is the Holocaust all a part of God’s plan for humanity? Do people get murdered, raped, or abused because God willed it? In situations like these, and in others that are much less dramatic, e.g. gaining or losing money on the stock market, I refuse to accept that God has even an ounce of responsibility in the suffering that ensues. My conclusions are based on what I come to know as the definition of evil and sin: any act, whether fully realized by the actor or not, that breaks from the divine will of God for the sake of one’s own will. The original sin was the choice by the primordial humans to disobey God and eat the fruit of the tree. In doing this, they brought into the world something that God did not create: a “no.” Like a stone thrown into still water, this act of disobedience caused a ripple in human history than could not be contained. Each act of saying “no” to God offered the same possibility to the next person, leading humanity to live in a culture of sin and separation from God. This is the imperfect world in which we live, and this is the world in which suffering is caused by evil. The problem with this demand is that it in order for God to intervene, he would have to remove the very thing that separates us from the rest of creation: our free will. Without it, we become like animals, working within a system of instincts and stimulus/response, unable to truly love God and one another. Of course it feels really bad when a friend or family member hurts your feelings, but would you rather them not have the ability to do such things? In the same way, God respects our autonomy from him and allows us to act against his will, hoping that we will choice to love him as he loves us. But just like his creation in the last post, this does not mean that God stands idly by, refusing to intervene. On a very basic level, he has intervened in human history by inspiring his priests, prophets, and kings to act out of justice and to reorient the people of God back to their Lord. He continues to do so today as he inspiring each one of us through our consciences, his living word found in the Bible, and the sacraments, each of which are channels of God’s grace in the world. Unlike suffering that comes as a result of God’s will, I do not believe that there is any divine purpose or ultimate plan for suffering caused by evil. It is not true that anything that doesn’t kill you makes you stronger: evil causes despair, hopelessness, and loss of faith, none of which God ever wants us to experience. I believe that God has, and will continue to intervene on behalf of humanity, but will always respect us as autonomous beings created in his image. This is the only way that we can truly love and be loved by God. 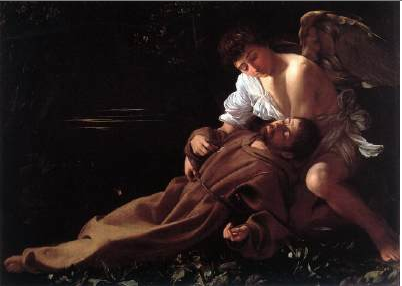 Francis was in a state of ecstasy, even in pain on his deathbed! Like Christmas and Easter for all Christians, the Transitus and Feast of Saint Francis are two holidays that are treated with the greatest reverence by all Franciscans. Around the world, the number of Franciscans in all three types of orders is in the hundreds of thousands (the order I am joining, O.F.M., is somewhere between 12 and 13 thousand, with the Secular Franciscans at about 400,000.) For many, the specifics of the celebration ranges greatly from community to community, but the purpose is the same: commemorate the life and death of our Seraphic father. In this case, our community celebrated with the Capuchin friars, Poor Clare sisters, and two other groups of Franciscan sisters that I unfortunately did not get a chance to meet. Narrator: On another occasion, when he felt that his end was not so far away, Francis once more asked his brothers to sing to him the Canticle of the Sun. And this time when they came to the end, Francis added still another verse–the praise of Sister Death. 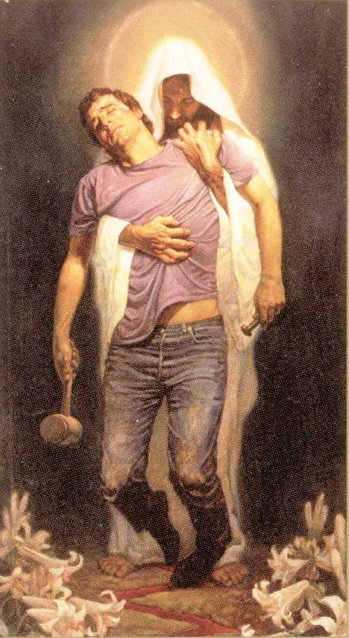 Francis: Praised be you, my Lord, through our Sister Bodily Death, from whom no one living can escape. Woe to those who die in mortal sin. Blessed be those whom death will find in Your most holy will. All: Praise and bless my Lord and give Him thanks, and serve Him with great humility. Francis lived his life up until his last breath as if he had never gotten over the fact that God loved him. He was always experiencing God in different ways, and like a loyal dog, treated everything like it was the most incredible experience yet. He was not saddened by death, but rather, welcomes it as the long awaited entrance into heaven. Simply beautiful. In recreating his final acts, we shared bread (not mass) and made for each other a sign of peace before concluding in joyful song. Following the Transitus was the full celebration of the Feast of St. Francis on October 4. Including the blessing of the animals, a commemorative mass, and huge feast, we come together once more as a large Franciscan community to look more broadly on the life of the great saint and celebrate the life of our own communities. It was a wonderful experience, to which we certainly did not forget the feast aspect! After mass, the many communities of Franciscans came together for a spectacular meal and fellowship in the spirit of Francis. All in all, it was a joyful experience and a confirmation of my call to follow Francis’ way to Jesus.